In the tabletop portion of PAX, gamers huddled over tables strewn with miniatures, cards, and RPG character sheets. They played Dungeons and Dragons, Magic: The Gathering, Risk, Clue, and just about any other game you could imagine. I even saw a particularly uproarious group engaged in a cutthroat game of Apples to Apples. The game checkout room in the tabletop section was a wonder to behold: games of every make and type, from backgammon to esoteric German board games, piled atop tables for attendees' use. Gamers looking for more passive diversions had more than enough to keep them occupied. Concerts by geek favorites like Jonathan Coulton, MC Frontalot, The OneUps, Freezepop, and the Minibosses ran late into the evening. Theaters rotated through gaming-themed cult classic films like The Wizard or Wargames and showed private screenings of shows like The Guild and Robot Chicken. Sunday morning featured a PAX crowd favorite: a gaming-themed version of Family Feud. PAX's annual Omegathon tournament offered even more evidence of the expo's diverse focus, with its 20 "Omeganauts" battling their way through such games as Peggle, Geometry Wars 2, Pictionary, and even Jenga. You couldn't go anywhere at PAX without running into one of the black-clad, ridiculously helpful Enforcers. In every room, at every event, and at every line you'd find an Enforcer (or three) managing lines, checking out games, or cheerfully helping maintain order. I don't know what sort of indoctrination these Enforcers undergo, but they're clearly an especially close-knit group, absolutely dedicated to the service of the expo. Many wore aviator goggles atop their heads, for reasons that remain unclear. And male enforcers, I noticed, have a penchant for wearing black kilts. At any rate, they're an unavoidable PAX feature, and they were far more polite and helpful in the face of PAX's madness than anyone had a right to expect them to be. 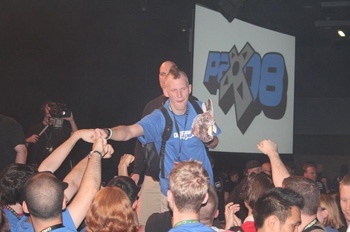 PAX began in 2004 as a modest, two-day gathering in Bellevue, Washington that drew just over 3,000 participants. Now, only four years later, it's a massive event. Yet it still somehow still feels casual and inviting. At its best moments, PAX feels like a big, friendly party, no more intimidating than an evening of gaming with friends. And you could hardly ask for more than that. Adam LaMosca is still recovering from a grueling PAX weekend, where long lines, huge crowds, and a case of fish burrito-induced food poisoning still didn't ruin his fun.